This page contains details of known surviving Paxman stationary steam engines and one which may not have survived (No 11179) and one which should have survived but, regrettably, was scrapped c.1990 (No 22351). If you have further information on any of the engines listed below, or know of another survivor not listed here, please contact me with details. For details of surviving portables go to Surviving Paxman Portable Steam Engines and pages linked from there. Build Year: Unknown, but believed to be early or mid-1870s. Description: 3 NHP Single Cylinder Inverted Vertical Steam Engine and Boiler - about 5½" bore x 9½" stroke. 36" diameter flywheel and 17" diameter pulley wheel. 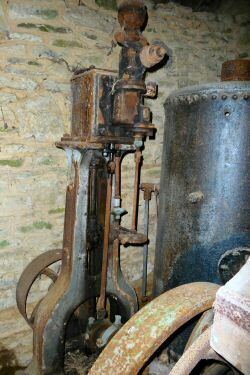 The boiler is of particular interest because it is probably the only surviving example of an early Paxman 'water tube' boiler. This type was relatively complicated and expensive to make, so during the early 1890s Paxman phased it out in favour of the more conventional 'smoke tube' type. Original Customer: The engine was probably ordered by, and delivered to, one of Paxman's Swedish agents: the main ones at that time being Baron C A Hermelin and Graham Brothers, both of Stockholm. Original Duty: At Trosa Brewery, Sweden. Trosa is about 35 miles south of Stockholm. Subsequent Relocations: Brewing ceased at Trosa in 1902 which is probably when the Paxman engine and boiler ended their working life. The Trosa premises remained in use as a storage and distribution depot for the Södertälje Brewery until closure in 1916. Sometime between 1928 and 1935 the Trosa Brewery was demolished and all the brewing equipment, including the Paxman engine and boiler, was transferred to an industrial museum at Södertälje Brewery, about 18 miles southwest of Stockholm. When production at Södertälje Brewery came to an end in 1955, the Trosa collection, including the Paxman engine and boiler, was transferred to the brewery museum at St Erik's Brewery, at Kungsholmen in Stockholm. Five years later, in 1960, the museum at St Erik's Brewery was closed and the Trosa collection was transferred to the new Pripps Brewery at Bromma, about 5 miles west of Stockholm, where it was placed in a basement store. In 1985-86 the Trosa collection and other historic items were transferred from Bromma to Arboga to form the basis of a new brewery museum. The Arboga Brewery Museum opened in July 1986. Considering all these moves, it is very fortunate that at each stage the engine and boiler have been preserved rather than scrapped. Last known Location: Arboga Brewery Museum, Arboga (approximately 80 miles west of Stockholm), Sweden (as at 2012). Last known Owner: Arboga Brewery Museum. 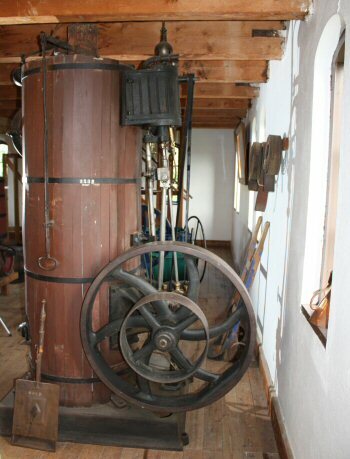 Notes: The earliest known surviving Paxman steam engine. Engine and boiler are mounted on a single cast-iron base. The general arrangement is very similar to that of a vertical engine and boiler exhibited by Paxman at the Vienna Exhibition of 1873. Occupying much less floor space than a horizontal engine and boiler, and costing less, this type of 'packaged' power unit proved popular for small factories and workshops. It was a highly successful product for the Company during its early days, selling in large numbers. A 3 NHP vertical engine advertised in Paxman's 1883 catalogue was 5½" bore x 9" stroke, had a 36" diameter flywheel and ran at 170 rpm. Paxman exhibited at the Swedish Royal Agricultural Show at Gothenburg in the summer of 1871. Sweden subsequently became an important export market for Paxman up to late 1877. The engine at Arboga is no longer in working order and because of minor modifications made during its working life it is no longer in completely original condition. Description: 4 NHP Inverted Vertical Single Cylinder - 6½" bore x 12" stroke. 4½ foot diameter flywheel. Original Customer: Thomas Davey & Co of Melbourne, Australia (possibly an agent). Originally sent to: Presumably Melbourne. Last known Owner: Mr Kym Zeitz (as at 2003). Notes: Acquired in September 2000 by Kym Zeitz. When purchased the engine was lying outside exposed to the elements, the cylinder head being occupied by a mud wasps' nest. Several key components were missing, such as the two slide valves, valve rods, the steam chest cover and throttling governor. Fortunately the cross head and bearings were in good condition. One of the major challenges facing Kym in his restoration was trying to find out details of the construction of the missing parts, particularly the unusual slide valves arrangement. Now completely restored, as pictured here, the engine runs smoothly on compressed air. 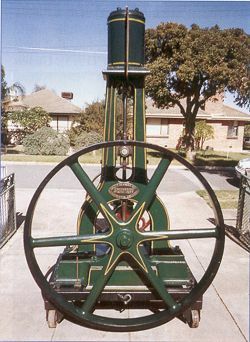 An account of the restoration was published in the Aug-Sept 2003 issue of The Old Machinery Magazine (Australia). At that time the intention was to complete restoration of a suitable boiler so that once again No 1402 could be run under steam. Description: 3 NHP Inverted Vertical Single Cylinder - 5½" bore x 9" stroke. 36" diameter flywheel. Original Customer: R B Sanson. Last known Location: Wiltshire, England (as at 2009). Last known Owner: Mr Paul Weaver (as at 2009). Notes: This is a Paxman "Standard" Vertical Engine and Boiler: a type with the engine and boiler mounted on a common bedplate. Although the old copy order book describes No 1530 as a '1 HP Vertical Engine', Mr Weaver tells me it is in fact a 3 NHP engine. Davey Paxman's June 1883 catalogue describes the 1 HP vertical engine and boiler as having a 3½" bore x 6" stroke, a speed of 250 rpm, an 18" diameter flywheel and a bedplate measuring 44" x 25". The 3 NHP version is described as being 5½" bore x 9" stroke, with a speed of 170 rpm, a 36" diameter flywheel and a bedplate 54" x 31½". Mr Weaver says the dimensions of his engine exactly match the catalogue description of the 3NHP. He knows nothing of his engine's early history but purchased it near Dunkerton, Somerset in 1978 and had it running well. The boiler is not original but the boiler fittings probably are. The flywheel has curved spokes. Mr Weaver disposed of the engine in about 1982 but aquired it again in 1987. It has not run since. The paint, now rather dark, is believed to be original. Description: Horizontal 10 HP Fixed Engine. Original Customer: John Palmer, Junior. Originally sent to: Rangoon, Burma (now Myanmar). Notes: Originally supplied with a Paxman Cornish boiler, 17' long x 4' 11" diameter. During the latter part of its working life, No 2205 was probably used to power a rice mill. The engine was clearly identifiable in 2005 from the maker's plate which was still attached and had the engine number cast into it. Now derelict as shown in the photograph here. Description: Horizontal 12 HP Class B Engine with single cylinder of 12" bore x 20" stroke. Original Customer: E Marriage & Son. Original Duty: Driving flour mill. Notes: When seen by Rob Dickinson in 2006 this engine was still in harness after 117 years service, driving a rice mill as shown in the photograph here. The engine still carried its original maker's plate, with the engine number cast in, and another plate which read "Supplied by Harry H Gardam & Co Ltd, Engineers, Church Street, Staines". The Gardam business was still trading in 1993, but had moved from Staines to Colnbrook. One assumes that Gardam acted as a dealer or agent, acquiring the engine from Marriage's Mill in Colchester and selling it on to a customer in Burma. Description: 6 NHP Standard (Inverted) Vertical, with a single cylinder of 8¼" bore x 12" stroke. Order Date: 17th March 1890. Despatch Date: 15th August 1890. Original Customer: Robert Spence - Mann Crossman & Paulin (brewery). Original Duty: Driving brewery machinery. Notes: The parentage of this engine is obvious from a comparison of the photograph of No 1402 above and the one shown here. Though there are many similarities in appearance to No 1402, the single slide valve arrangement of the later engine is much simpler. Very nicely restored in 1986 by the late Russell Weavers (pictured here with the engine) who also subsequently maintained it. Since restoration the engine has been regularly steamed. Description: Horizontal 16 NHP Compound Undertype with cylinders 8" and 13" bore x 14" stroke. Original Customer: King & Co. Originally sent to: Zurich, Switzerland. Original Duty: Installed in a dredger. Notes: Although described in the order book as a Compound Undertype Engine it was not supplied with the locomotive type boiler normally associated with Paxman undertypes and is therefore very similar to one of the Company's "Colchester" engines. Instead of the 5' 6" diameter flywheel normally fitted to this size engine, it has twin 38.5" diameter flywheels (not of Paxman manufacture) because of the restricted space between the dredger's decks. Fitted with reversing gear and consequently no automatic expansion gear. In 1982 the engine was purchased by Colchester Borough Council with the intention of displaying it in a glass case in the newly constructed Culver Precinct. The Council subsequently changed its mind and decided on a fountain instead for the Precinct. 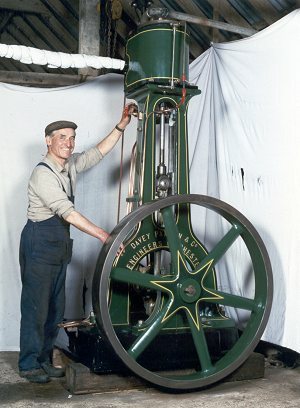 The engine was restored by Paxman apprentices c.1983 after which it was stored in less than ideal conditions in Castle Park until being moved to the Museum of Power at Langford. 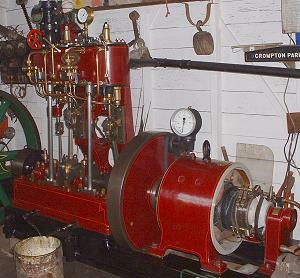 The engine is now on display at the Museum where it is regularly run on compressed air. Photo © R J Mundy, who painted the engine c.1985 as shown here. Number: To be identified. If the number can be found, details of the original order can be retrieved from surviving Paxman records. Build Year: Believed to be in the 1890s. Description: Horizontal (14 NHP ?) Duplex Girder Haulage Engine with cylinders of 12" bore x 14" stroke. 5' diameter flywheel. Last known Owner: English Clays Lovering Pochin & Co Ltd, St Dennis. Notes: Probably installed second hand at Parkandillick where it was used as a skip winding engine for hauling china clay waste to tip. Coupled to a two drum winch built by Bever Dorling & Co of Bradford. In preservation and operable on compressed air. Most of the above information from The End of a Revolution, The Last Days of Stationary Steam by Colin Bowden, Landmark Publishing 2008, pp 40-41. Description: Horizontal Single Cylinder Class B Engine. Last known Location: Pathein (previously called Bassein), Irrawaddy Division, Myanmar (2005). Notes: Seen and photographed at work in a rice mill by Rob Dickinson in 2005. The picture here shows that the engine is mounted on its original bedplate from which it can confidently be indentified as having always been a single cylinder version of Paxman's Class B type. Last known Location: Nyaungbintha, Sagaing Division, Myanmar (2006). Notes: Seen and photographed at work in a rice mill by Rob Dickinson in 2006. From the pictures taken by Rob it is clear the engine is no longer on its original bedplate but one constructed locally of concrete or concrete blocks. Part of the piston tail rod is visible which suggests the engine might originally have been a tandem, rather than a single cylinder, type. 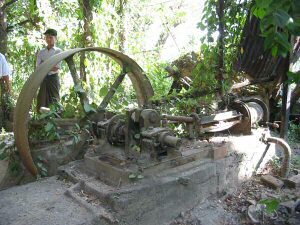 This is thought unlikely, however, as late 19th century customers in Burma can be expected to have opted for engines of minimum mechanical complexity. Another possibility is that this engine is a condensing type and that the tail rod operates, or once operated, the condenser's pump. Description: 25 NHP Class C Horizontal Engine with single cylinder of 16½" bore x 32" stroke, developing 180 bhp at 100 rpm. Order Date: 22nd May 1896 Despatch Date: 30th November 1896. Original Customer: London & Western Australian Exploration Co. Originally sent to: Fremantle, Western Australia. Original Duty: Western Australian Goldfield. Owner: Colin Puzey (as at 2008). Notes: This engine survived until 7th January 2016 when the museum and about 95 houses in the small community of Yarloop were burnt down in a disastrous bush fire. A real tragedy for the people of Yarloop and all who worked so hard to create and develop the renowned museum. What was one of the best preserved 19th century Paxman horizontal steam engines is now probably a total loss. There was no ambiguity about the identity of the engine. Colin Puzey once informed me that, although to his knowledge there had never been any maker's plates on this engine, he found the number 9089 stamped on no less than eleven of its components. The name of Davey, Paxman & Co, Engineers, Colchester, England was also on the valve chest cover and the frame. The Paxman order book entry shows that No 9089 was one of two identical engines ordered on 22nd May 1896, each to be supplied with two 21' long x 5' 6" diameter Cornish boilers. All six items were despatched from the Colchester works to Fremantle in November 1896. From the customer's name there is little doubt the engines were destined for the Western Australian goldfields. At the time these goldfields were a source of several orders for Paxman engines but No 9089 was possibly the only survivor. 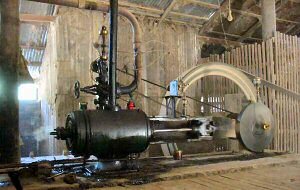 From 1940 to 1969 the engine was used to run Lyall's Timber Mill at Collie about 60 km south east of Yarloop. The original Paxman governor was replaced in about 1941 with a 4" Pickering governor, apparently to give the engine greater flexibility over a differing load range. Description: Horizontal Single Cylinder Girder Engine of 19" bore x 24" stroke driving a Linde Type 5A Ammonia Compressor of 10" bore x 21" stroke. Slide valve with Paxman Patent Automatic Expansion Gear. Flywheel 8' 6" diameter x 12" wide. Output 55 IHP with steam at 45 psi and at speed of 65 rpm. Design speed was amended to 70 rpm. Order Date: 30th September 1901 Despatch Date: 1st January 1902. Original Customer: Linde British Refrigeration Co Ltd, London (Linde Order 11040) for Wilderspool Brewery. Originally sent to: Wilderspool, Warrington. Original Duty: To drive Ammonia compressor for refrigeration at Greenall Whitley's Wilderspool brewery. Last known Location: After removal from Wilderspool it is believed to have become a 'feature' in the garden of the Managing Director of Manchester Demolitions, the business contracted to demolished part of the old brewery. It may now have been acquired by another owner. Last known Owner: see above. Notes: In practice the steam pressure used was 60 psi and at some stage the running speed was increased to 75 rpm. 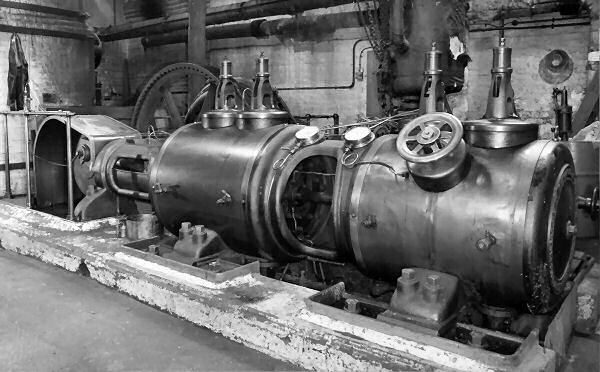 The compressor as well as the engine was built by Paxman who made large numbers of refrigeration compressors, over many years, for the Linde Company. 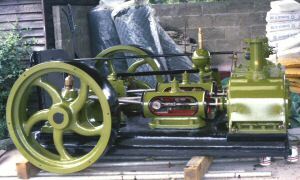 Greenall Whitley closed down the Wilderspool brewery in 1991 at which time this engine and two 1884 Thornewill & Warham horizontal engines (now in Markham Grange Steam Museum, near Doncaster) were removed. All three engines were reported to be in excellent condition at the time. A spare part for the compressor was supplied as late as November 1947 so it must have remained in use until after that date. The steam engine side (left) and ammonia compressor side (right) of No 11179 at Wilderspool Brewery. Number: There is a question as to whether this engine was given a number. It was built under Paxman order/contract No 6438, but no number is entered in the copy order book and Craig Ashman at Sovereign Hill has advised that there is no number stamped on the engine. Description: Horizontal 8 NHP Coupled Compound Condensing Girder engine, Class B, with cylinders of 5½" and 9" bore x 14" stroke. Two 5' flywheels with 7" faces. Paxman Patent Automatic Expansion Gear on the High Pressure cylinder. Working pressure: 140 psi. Order Date: 4th September 1901 Despatch Date: 1902 ? Original Customer: Ballarat School of Mines, Ballarat, Victoria, Australia. Original Duty: Installed as an experimental engine in the School's Engineering Laboratory which was formally opened in 1903. Notes: Specially designed as an experimental engine for the Ballarat School of Mines, it can be operated as a single cylinder engine using either of the cylinders. Craig Ashman, Steam Operations Manager at Sovereign Hill, dismantled the engine at the University in preparation for transfer to Sovereign Hill where it arrived on the 19th May 2006. Craig says there is no engine number stamped on either cylinder cover, even though there is a spot assigned for it, nor is the number stamped on the cranks. 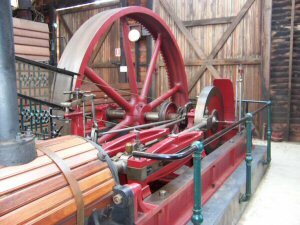 At present the engine is in Sovereign Hill's historical collection store facility until a suitable place can be found to display it in the museum. 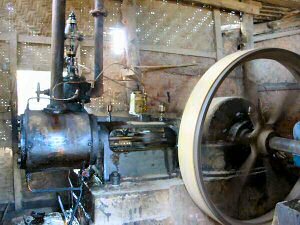 The engine is shown here at the University of Ballarat before its transfer to Sovereign Hill. Description: 4 NHP Compound 'Windsor' (Inverted) Vertical Engine with cylinders of 4" and 6½" bore x 6" stroke. Order Date: 26th May 1906 Despatch Date: 20th November 1906. Original Customer: Selby Urban District Council. Originally sent to: Selby, Yorkshire. Original Duty: Electrical power generation - coupled to a Crompton dynamo - for lighting and driving line shafting in the workshop. Last known Location: West Mersea, near Colchester, Essex (as at 2009). Last known Owner: Mr Andrew Phillips, Colchester (as at 2009). Notes: Engine formerly at Brayton Barff Pumping Station (of the former Yorkshire Water Authority), near Selby, Yorkshire. After transfer to West Mersea it was nicely restored and maintained by the late Russell Weavers. The engine has been regularly steamed since its restoration. Description: Horizontal Tandem Compound Lentz with cylinders of 10½" and 17" bore x 18" stroke. 7' diameter flywheel. Originally sent to: Isleworth, Middlesex. Last known Location: Somerset or Devon (as at 2012). Last known Owner: Mr Chris Black (as at 2012). Notes: In 1927 the engine went to a furniture manufacturer, Thomas Glenister & Co of Temple Works, High Wycombe, where it was coupled to an alternator to generate power for woodworking machinery and stayed in regular use until 1990. 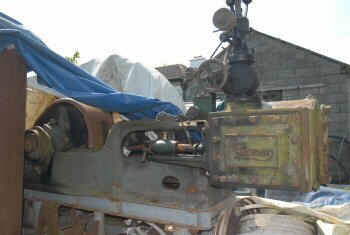 The engine remained in situ at Glenister's factory until being removed in 1996/7, after having been purchased by Mr Richmond-Dodd of Ascot. The engine is currently (2012) in storage, in a dismantled state. According to Chris Hodrien, the ISSES's Technical Adviser, it is by far the best surviving example of its breed that was left working in the UK up to 1990, and noted for its technical interest and beautiful condition. With a design speed of 200 rpm and working steam pressure of 170 psi, the engine produced approx 200/220 bhp. Paxman-Lentz No 18581 in April 1991. Photograph © Colin Bowden. Description: Horizontal Coupled (Cross) Compound Lentz with cylinders 17¾" and 29¼" bore x 30" stroke. Order Date: 22nd July 1914 Despatch Date: 23rd February 1915. Original Customer: Denny Mott & Dickson (Leonowen). Originally sent to: Bangkok, Thailand. Original Duty: Driving a teak sawmill by ropes. Flywheel grooved for 17 x 1¼" dia ropes. Notes: Denny Mott & Dickson and Leonowen were well-known names in the timber trade. The 'Leonowen' entered in the order book was probably Messrs Leonowen Ltd. Louis T Leonowen was an important figure in the Bangkok timber trade. Francis Orr, an American steam engine enthusiast, first saw the engine when he visited Bangkok in about 1990/91. He took a lot of pictures, including some video which he still has (as at 2009), of the engine in operation. At that time it was, in his own words, "all shiny and bright". He believes his next visit was in late 1996 when he found that a beautiful big tree over the outside engine room door had been cut down and a power pole was being installed to convert the mill to all-electric. The reason given was the lack of logs. To start up and keep the steam plant running, required a large and sustained supply of logs. With all the restrictions on cutting, the mill's log input had dwindled down to confisticated logs cut illegally. The engine was seen by Rob Dickinson of Beijing during his visit to Bangkok in October 2009, but only through a small gap in the corrugated iron sheeting surrounding the firmly padlocked engine room - see Rob's web page www.internationalsteam.co.uk/mills/thaimill09.htm . Rob hopes to be able to visit again in 2010 and to arrange access to the engine room so that he can take more detailed photographs of this engine. Paxman-Lentz No 18842 on 26 October 2009. The top of the large grooved flywheel for rope drive can be seen in the background. Photograph by courtesy of and © Rob Dickinson 2009. Description: 7 HP Semi-Portable Engine & Boiler with single cylinder 9¼" bore x 12" stroke. 5' diameter flywheel. Order Date: 15th January 1920 Despatch Date: 3rd June 1920. Original Customer: John Birch & Co.
Last known Location: Waimaw, Kachin State, Myanmar (2007). Notes: This semi-portable was still in commercial use in a rice mill when seen by Rob Dickinson during one of his visits to Kachin State in 2007. He was shown the original maker's plate which confirms the identity of the engine. One wonders if there is significance in the wording of the entry in the Paxman order book which reads "7 HP Semi-Portable Engine & Boiler" rather than just "7 HP Semi-Portable Engine". The Paxman semi-portable, as illustrated in the Company's 1913 catalogue, has its motion mounted on the boiler, exactly the same as the true portable. The order entry wording suggests that in this case the motion and boiler were two distinct items. Whatever the original configuration, Rob Dickinson's photographs here show the motion not mounted on the boiler but on a plinth and girder frame near the boiler which is fired on rice husk waste. To the left is No 20241's motion and to the right the boiler clouded in steam and smoke! Photographs by courtesy of and © Rob Dickinson. Description: Horizontal Single Cylinder Class K Engine with cylinder 13" bore x 16" stroke. It has a Pickering governor and a 6 foot diameter flywheel. The surviving Paxman microfilm record of the contract for this engine states that it is "to be capable of developing 34 bhp as normal load and up to 44bhp as maximum load at 105 rpm with 100 psi steam pressure". Original Customer: see notes below. Originally sent to: see notes below.. Original Duty: Probably to drive machinery in a coffee processing plant. Current Duty: Driving sugar mills (as at 2010). Location: 20 km (12½ miles) from Turrialba in Costa Rica (as at 2010). Owner: Assukkar S.A., San José, Costa Rica (as at 2010). Notes: No 23298 was built under Paxman Order No 17268 and the surviving copy order book shows the customer as E H Bentall & Co of Maldon, Essex. The microfilm record of the order states that the engine is for Bentall & Co for export. During the 1920s Bentall, like Paxman, was an associated company of the Agricultural & General Engineers combine. Bentall manufactured agricultural machinery and machines for processing agricultural produce. The likelihood is that Bentall & Co would have ordered the steam engine from Paxman to supply to a customer with some of their machinery which required a prime mover. Former Bentall employees have confirmed that their company did make machinery for the coffee industry so perhaps the engine and machinery were originally for the coffee processing plant where No 23298 was installed before being moved to its present location. The contract record states that the engine used to fulfil the order was stock engine No 3064. It also goes into some detail about the slide valve and efforts to change it from that fitted to the stock engine. It would appear this was related to the material used, i.e. bronze instead of cast iron, but it looks as though the engine was despatched with the stock engine's original slide valve. Mike Gipson has managed to find an image of the drawing for this order (Drawing No 950.115). This was for a balanced slide valve but it is unclear whether this got fitted. As at mid-2010 the engine was in regular use and was expected to remain so for at least another two to three years. It was now installed in a sugar processing plant, producing brown sugar from sugar cane, and drove small 20 hp sugar mills through a reduction gearing arrangement. The exhaust steam from the engine was used to heat an evaporator which processes the juice extracted from sugar cane. 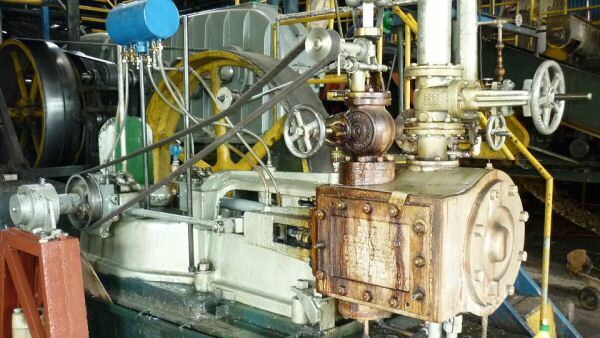 Assukkar's Plant Engineer knew the engine had been purchased in about 1995 from an old coffee processing plant where it had been in use for many years but he had no more information about its previous history. On 4th December 2010 an email was received saying "Today we broke the crankshaft …". It is thought this was a 'bending failure' due to misalignment of the bearings. No information has been received as to what has happened to the engine since the failure. 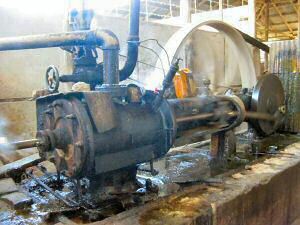 The Paxman Class K engine No 23298 installed at the sugar processing plant in Costa Rica. Photograph courtesy of Cristian Camacho, 2010. Description: Horizontal Single Cylinder - probably a Class K Engine. 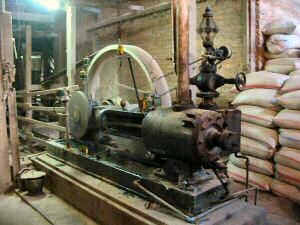 Last known Location: Za Bu Nyunt Rice Mill, Paline, near Shwebo, Sagaing Division, Myanmar (November 2012). The engine is identifiable as a Paxman from the maker's name cast into the valve chest cover plate. On this, the Company's name is in the style of Paxman's logo during the 1920s. From the estimated date and general look of the engine, I think it is probably a Class K but, being no expert, am open to correction. 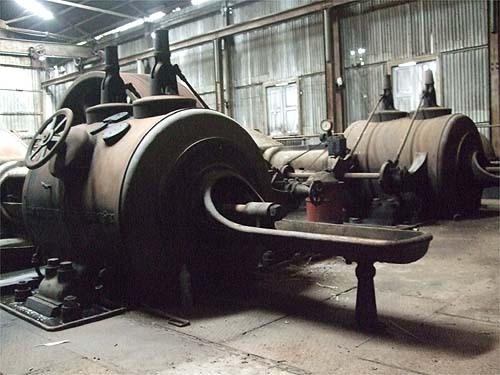 If anyone visits this mill in future could they please see if the engine can be stopped for five minutes and the flat ends of the crankshaft inspected for a five digit number which should be stamped on one end. If that number is emailed to me I can check the relevant order book entry. Description: Horizontal Tandem Compound Lentz with cylinders 14" and 23" bore x 24" stroke. Rated output 250 bhp at 150 rpm. Working pressure approx 90 to 110 psi. Original Customer: Aylesford Pottery Co, Aylesford, Kent. Original Duty: Driving machinery in a pottery. Last known Location: Plumstead Marshes (1989). Notes: Installed second hand at the sawmills of J W Ward & Son Ltd, Bourne End, near Hemel Hempstead, where it drove a 150 kW General Electric (Schenectady, New York) alternator by four ropes from an 8' diameter flywheel grooved for twelve ropes. It was stopped in 1980 and the sawmill ceased operation in 1981. The engine was removed for private preservation in 1982 and seen in 'rough' outdoor storage at industrial premises on Plumstead Marshes in April 1989 by a party from the International Stationary Steam Engine Society (ISSES). It was part of a large collection of railway and stationary equipment being assembled for a putative steam railway/museum project in Kent. When that crashed, the owners tried and failed to find a purchaser for No 22351 and having failed, scrapped it (c.1990). Description: Horizontal Single Cylinder Class K Engine with cylinder 14" bore x 16" stroke. Type KC4. The KC4 was designed for working with steam at 80 psi to produce 50/58 bhp at 140 rpm. Pickering governor. Original Customer: Lamb Brothers Limited. Original Duty: In a jam factory. Last known Location: near Tullamore, Ireland (2010). Notes: Built under contract/order No 17509 and originally installed in Lamb's jam factory in Dublin. Found in May 2010, during a visit to Ireland by John Cooper and Brian Hillsdon, under a tarpaulin in the back yard of a property near Tullamore. Condition considered to be generally good apart from some surface rust. Acknowledgements: My thanks to the following who assisted with information on the engines featured on this page: Chris Hodrien, Technical Advisor & Publicity Officer of the International Stationary Steam Engine Society (ISSES), Colin Bowden, Rob Dickinson (engines in Myanmar and the Paxman-Lentz in Bangkok), Colin Puzey (No 9089), Paul Weaver (No 1530), Alex Walford, Craig Ashman, Steam Operations Manager at Sovereign Hill Museum, Australia, Cristian Camacho, Plant Engineer, Assukkar SA, Costa Rica (No 23298) and Bo Andersson of Kungsör, Sweden, who researched the history and provided photographs of the engine and boiler at Arboga. Rob Dickinson has travelled extensively in the Far East researching stationary steam engines. For more about his adventures and pictures of some of the engines he has found, visit his website at internationalsteam.co.uk/mills/livesteam.htm . Rob also has available for purchase his DVDs (sets of 8) of steam engines in Burma - for details see internationalsteam.co.uk/dvd/temples.htm .